Asian Size, Runs Smaller than UK Size. Choose 2 Size Up Before Ordering. Detailed Size Info Please Check Left Image to Get the Fit Size. Imported and Material with Cotton Blended and Polyester, Breathing, Soft and Stretchy. Design: Loose Stretch Fit, Pull On Closure, Pullover Neck, Plaid Jacquard Quilt Fabric, Adjustable Hood with Interior Drawstrings, Slim Fit Shirt with Knit Cuff. Occasion: Casual Style. Suit for school, work, athletic, party, home and leisure life. Perfect gift for friends,families and boyfriend. Spring, Fall, Autumn, Winter. Any season is Suitable. 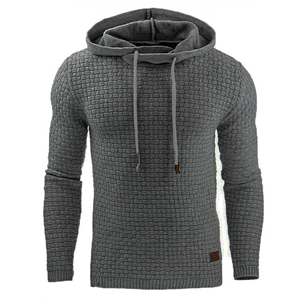 Fashion Male Hoody Sweatshirt Top in 2017, Sporty Casual Fitness Coat Outdoor.